During the postgame press conference after losing to the Spurs in the Finals, it sounded like he wasn’t going to stick around in Miami. 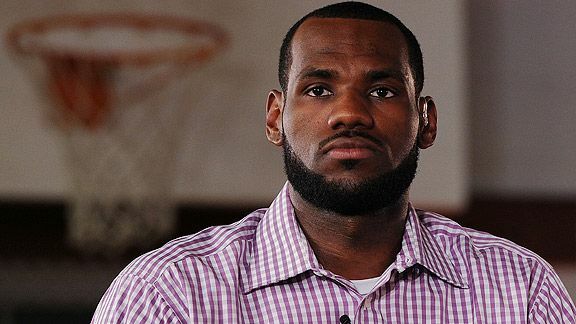 Listening to LeBron in this postgame conference, sounds like he's not going to stay in Miami. I thought maybe he can play one more year before then letting his contract expire. But looking at the fading talent on that roster, in terms of his own success, it’s best that he leaves. One more year with the Heat, which could still happen, might be one of the very few decent options he can ponder. Now I wonder where he will play. If he’s smart, he stays in the East. It’s an easier path to the Finals in the East at the moment. But only a handful of teams have championship caliber talent. In fact, I think the Bulls and Pacers are the only two Eastern teams that are legit. I doubt James goes that route. So does the man go West? Does James join a struggling team and try to make them relevant? Or does he join an already stacked team and use them for another chance at a ring? Or does James do what some of us think he should do? Yes, I’m talking about a return to Cleveland. That would be great. Well, this summer is going to be something. Just don’t make your decision on my birthday, again. This entry was posted in Miami Heat, NBA and tagged LeBron James. Bookmark the permalink.